I ended up with 5 lbs. 11oz. 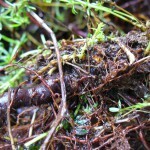 of cleaned Lady’s Bedstraw roots. I extracted the roots in two batches because they didn’t all fit in one pot. The first pot held 4 pounds, and the second was 1 pound 11 oz. I extracted each batch of roots twice, and used the baths separately. With the first batch, I put in one and a half Tums for the calcium and I watched the temperature closely (not exceeding 150 degrees F.), but had forgotten about pH with the bedstraws. After straining out the roots, initially the color of the first skein was very drab and I was pretty disappointed. Then I checked the pH and was amazed to see it was pH5 despite the Tums. I took out the skein, added calcium carbonate and washing soda (I ran out of soda ash), and brought the pH up to between 9 and 10. I reintroduced the skein, and woo hoo, pink! A sort of 1980s Giant Foods raspberry sherbert shade. Part way through the process, here are the yarns dyed with Lady's Bedstraw roots. The pinker colored yarns on the left are from the first batch of roots, and the orange colored ones on the right are from the second. I have exhausted a couple more baths since this photo was taken, yielding lighter colors. I also tried one pound of the tops, but got a pretty boring yellowish beige. There were about 4 more pounds of tops but I decided not to bother using them. 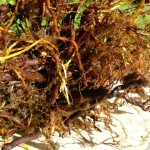 I am currently soaking the roots for a third extraction. After they had softened up, I cut the woodier chunks into smaller pieces. I managed to break our non-food food processor trying to grind them up (annoying!) so chopped up small will have to do. I expect I can get one or two coral colored skeins before all is done. This past weekend I had a lovely visit with my mother at her farm in New Hampshire. 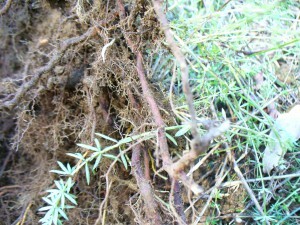 While I was there, I finally dug up some Lady’s Bedstraw which I had planted about 10 years ago. At the same time that I planted a bed of Lady’s Bedstraw, otherwise known as Yellow Bedstraw or Galium verum, I also put in a bed of madder (Rubia tinctorum, both ordered as seedlings from Richters in Canada). I dug up the madder two years ago when I wanted to establish a new bed, but hadn’t gotten around to the bedstraw. When I first planted it, my mother and I very diligently prepared the raised beds with lime and chicken manure and other amendments, and then they sat and mostly had to fend for themselves. The boards holding up the beds rotted. The blackberries moved in. The bedstraw held its own. People usually say to harvest the roots after 3 years. Better late than never. After so many years in the same location, the bedstraw has decided to expand its territory. We do not want it to spread too far in case it proves difficult to control. I dug about a fifth of the bed on Sunday October 9th. 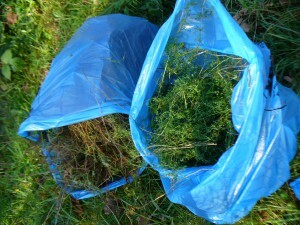 The roots and tops were hard to separate, so I collected them together in bags. 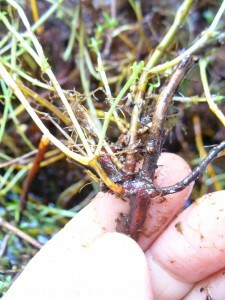 Like other bedstraws and madder, the plants spread by setting down roots from the nodes on the stems, as well as by seed. A lot of the roots were small. A few were amazingly thick and interlocked. 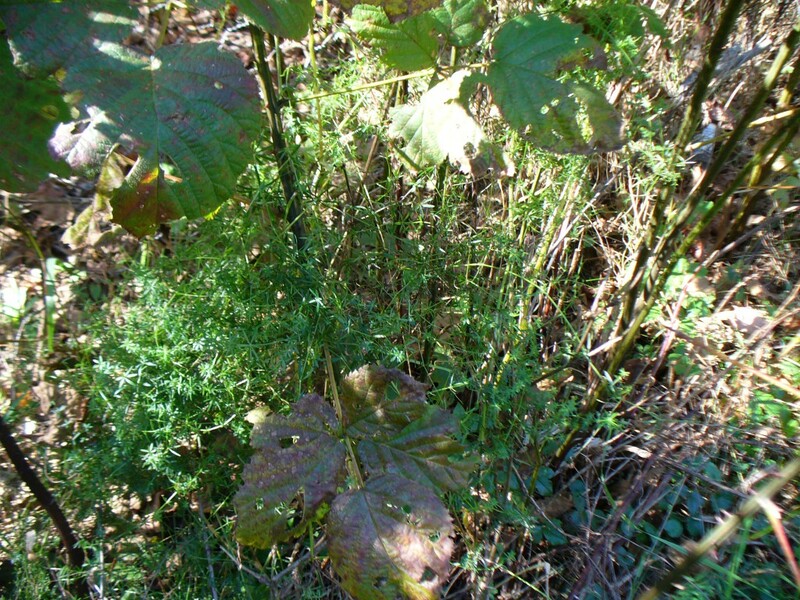 Even though it’s fall and the aerial parts of a plant are supposed to be dying back, there was plenty of fresh greenery. Plants are amazing. Tender new growth despite a couple frosts. I love that crazy yellow where the new shoots come out. The combined weight of the bags was 17 lbs.! A lot of that was soil. Rinsing the soil off, separating the greenery from the roots, and cutting up the roots took me a couple days. 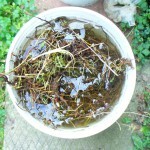 Five gallon bucket of roots soaking to rinse off the soil. They didn’t all fit in this bucket. 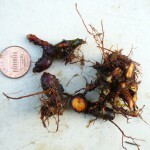 Some good sized roots, but see penny for comparison. There weren’t a lot of roots as thick as these. A very dense root cluster. It took me a while to get to the heart of this. 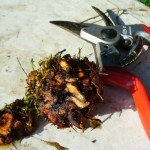 After washing and trimming, the roots weighed 5 pounds. 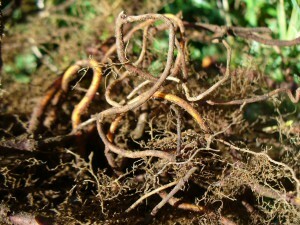 I plan to use these roots, and perhaps the tops, for the first in a series of rya rugs. 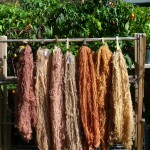 My idea is to dye the wool for each rug with locally grown or gathered natural dyes. The palette of each rug will be determined by certain parameters, for example, whatever 5 lbs. of Lady’s Bedstraw can dye. Stay tuned for the dyeing results.